Over twenty years ago when it first opened, Lam’s was a tiny grocery store barely larger than 700 square feet. It was a family-run affair like most other small businesses in Little Saigon. Mac and Judy Lam would put in long hours with their five kids — three sons and two daughters — who would come in after school and on the weekends to help out. Lam’s is unique in that it carries many exotic products and ethnic foods. We have an inventory of over 10,000 unique items. These pics below are just the tip of the iceberg. 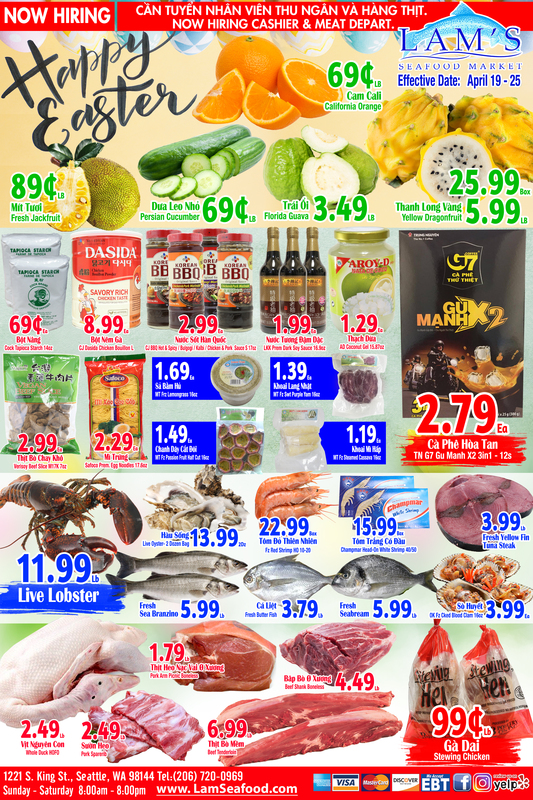 Lam’s Seafood Market gets plenty of Fresh Seafood from the Washington Coast and Alaska! Lam’s is the perfect location to find your everyday meat and seafood, as well as some hard to find items as well! Lam’s Seafood has all your basic fruit and veggies covered, but we also have some rare and exotic produce you won’t find anywhere else! Whether you want to get bubble tea, a small snack, or a full meal, our Deli can help you fill your cravings! You will find a unique selection of gifts, kitchenware, rice cookers, dishes, home décor, and beauty products. Are you ready for Lam's seafood specials? Typically, salmon are anadromous: they hatch in fresh water, migrate to the ocean, then return to fresh water to reproduce. However, populations of several species are restricted to fresh water through their lives.